Known as the “King of Spices,” pepper is one of the oldest and most popular spices in the world. Once considered more valuable than gold and often used to pay taxes, dowries or ransoms. The Romans extravagantly used it to spice their foods, thus becoming a status symbol of fine cuisine in Europe. This globular, dried, unripe berry becomes wrinkled and black after the green peppercorn is picked and dried. Its highly pungent taste and earthly aroma provides that unique “bite” and wonderful bouquet. 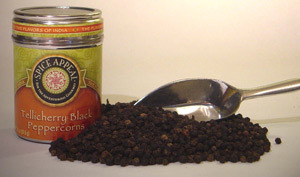 The Tellicherry pepper is a larger, more mature peppercorn that has a more aromatic, fruity, clean bouquet with less pungency. Add to almost any dish. Adds a more hearty and stronger flavor to steak, pot roasts, hamburgers, soup stalks, meatballs, gravies, sausages and cold cuts.